The manager at our hotel in Sami asked us what we were going to do on our first day on Kefalonia. We told him we were going to Argostoli. He didn't appear to be pleased, so we asked him what was wrong with Kefalonia's capital, but he didn't want to answer this question. For us, there was a very good reason to go to Argostoli: we were out of books and we couldn't find any English books in Sami. So we went to Sami to rent a car. And here the same thing happened. The man from the car rental agency tried his very best to convince us to go anywhere on Kefalonia, but not to Argostoli. We were intrigued, now we had to see this city for ourselves, no matter what difficulties would be put in our way. We had to know what was wrong with this city. And strangely enough, there's nothing wrong whatsoever. The best reason we could find was that there are hardly any tourists, only local people selling and buying at the food-market. Well, we liked that better than beaches filled with tourists. 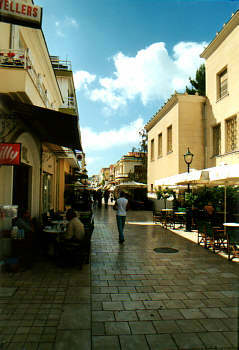 One of the first things we saw in Argostoli was this street with lots of shops, the first shop being a bookshop. Our book problem was solved, time to have a look around. 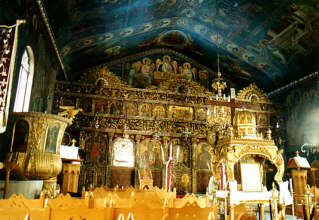 When we walked past this church, the priest asked us in to have a look. Well, it look rather impressive for a small church, doesn't it? 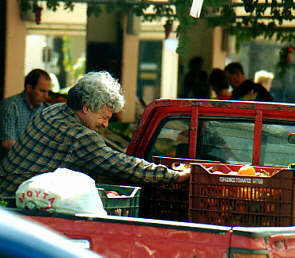 Along the boulevard there is a nice small-scale market, where local people sell whatever fruit or vegetables the have. We always love to see people working. 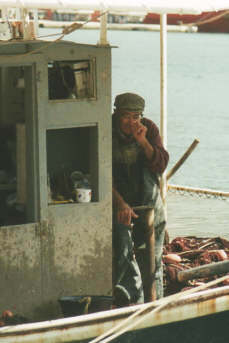 And of course, there are the fishermen in the harbor, selling the catch of the day. In the evening, we saw the same little fishes at the restaurant we went for dinner. The waiter said he didn't like this type of fish himself, so we didn't try them. And as you can see the fisherman on the right doesn't like this fish either, he prefers the contents of his nose. 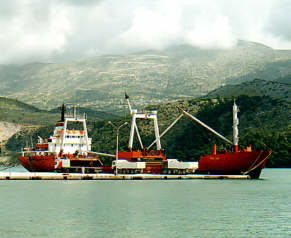 The harbor of Argostoli is quite large for a city of only 8.000 inhabitants. The boat on the right is the largest boat we saw on our trip along the Ionian islands. In the background you can see the road to Sami. When you look at the church tower on the right, at first you see nothing special. When you look closer, you begin to wonder whether this church might also be a mosque... And we thought there weren't many Muslims in Greece. Maybe those loudspeakers serve some other purpose? After a few hours in Argostoli we gave up. We couldn't find any reason why this city should be avoided. We even rather liked it. Because we wanted to know the answer, we asked anyone from Kefalonia, who happened to read this page and know the answer, to email us. And now we know the answer. 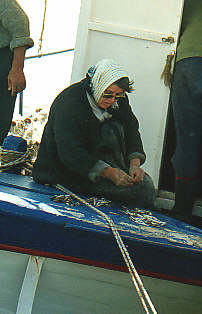 Paul wrote us: The reason the locals in Sami did their best to gently stop (or more politely dissuade) you going to Argostoli is complicated to explain but basically it is an Island divided with political alliances, and you were crossing borders, the same reaction would have been experienced if you said you wanted to go to Lixouri. However it is interesting to note they all have to go to Argostoli to get just about everything and anything of any importance!! Tourist euros are a different matter, they all try to keep those in house as it were!! According to Donna, the answer is like this: It is the same reason the people on Lixouri don't like Argostoli too. 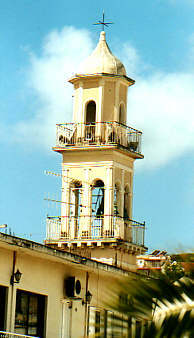 Argostoli is the capital of Kefalonia. Apparantely years ago the capital was Lixouri. Fiscardo too thought they should be the capital as that was the only town still standing after the earthquake. So it is basically a jealousy of Argostoli for being capital. Thanks, both Paul and Donna. We really appreciate this !! !